Dr. Haddon taught me this game. It is well known in Great Britain; and the Rev. John Gray (p. 117, figs. 1, 2 and 5) has published a description of it as played by the children of the Cowgate in Edinburgh. He gives the different movements of the figure as separate figures, namely, "The Bunch of Candles," "The Chair," "The Pair of Trousers," "The Crown." In Ireland "The Bunch of Candles" is sometimes called "The Broom." Miss Margaret A. Hingston (p. 147) gives the story which was current in Somerset about forty years ago; the "tipstaff" is here called the "truncheon." First: The first movement of the "Apache Teepee." The two strings now hang down from the left hand over the palmar string (Fig. 564). 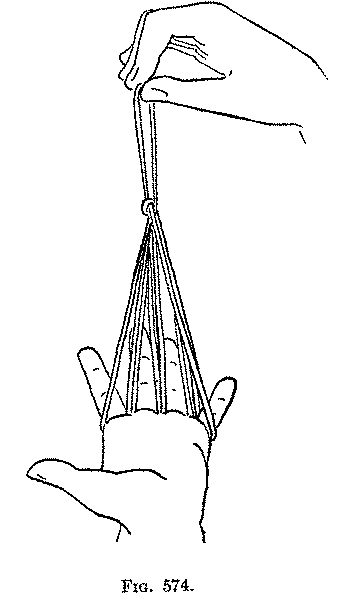 Second: With the right thumb and index pick up the string on the left palm, between the hanging strings, pull it out slightly (Fig. 565), and put it over the left middle and ring fingers (Fig. 566). There is now a ring around the left index, a ring around the left little finger, and a loop hanging down on the palm (Fig. 567). Third: Put the right index from above into the ring on the left index; and put the right middle finger from above into the ring on the left little finger, and draw the rings out to the right (Fig. 568) as far as possible. Fourth: Bend the fingers of the left hand down on the palm as follows: The left middle finger down into the left index loop, the left ring finger down into the left little finger loop (Fig. 569), the left little finger over the left far little finger string, and the left index over the left near index string. 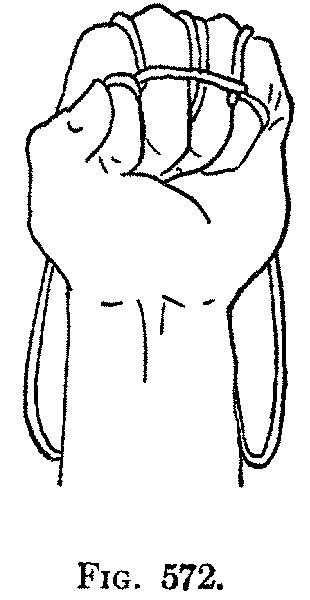 When the left fist is thus closed, you have a string coming out between the index and middle finger, two strings coming out between the middle and ring fingers, and a string coming out between the ring and little fingers. 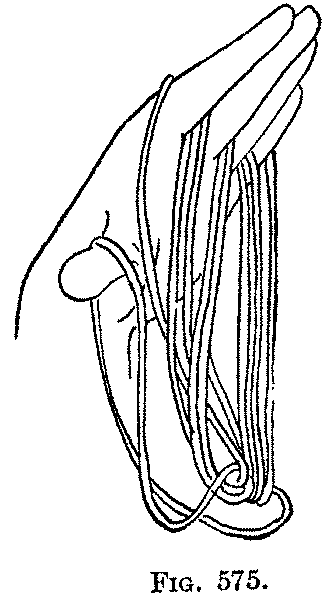 Over the backs of the fingers, at their bases, there is a string around the index finger, a string around both the middle and ring fingers, and a string around the little finger (Fig. 570). Fifth: With the thumb and index of the right hand pull up slightly the string on the backs of the left middle and ring fingers, and pass through this loop to the back of the hand the four strings coming out between the fingers of the left fist (Fig. 571); let the strings, pulled entirely through, hang down on the back of the left hand (Flgi 572). 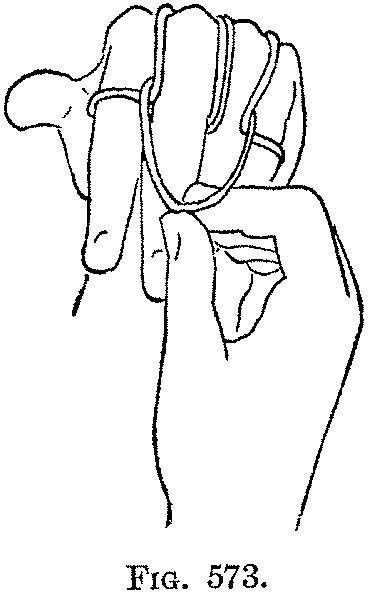 Sixth: With the right thumb and index pull this same loop crossing the backs of the left middle and ring fingers (through which you have just passed the four strings) over the knuckles of the middle and ring fingers (Fig. 573), and to the palm of the left hand; then draw it out to the right as far as possible, but carefully, and not too hard, at the same time unclosing the left fist, and (with some stretch of the imagination) you get the four tallow dips on the left hand (Fig. 574). The story of the tallow dips is as follows: "A man stole a pound of tallow dips, and bringing them home hung them on a peg." 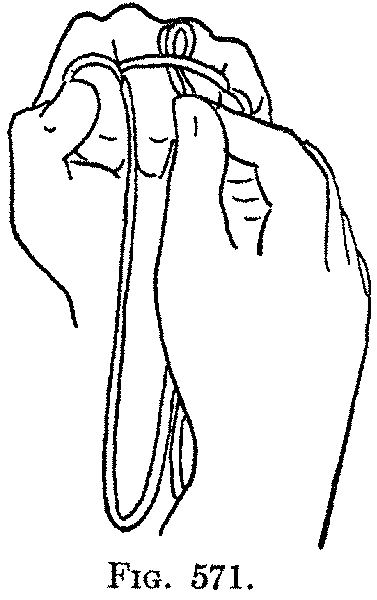 Seventh: At this point, place the loop held by the right thumb and index over the left thumb and, being careful not to twist it, let it hang down (Fig. 575). "And being very tired he sat down on a chair and went to sleep." Eighth: Now, pointing the right index and middle fingers downward, over the back of the left hand held palm down with the fingers pointing to the right, take up from the left side on the ball of the right index, the loop on the back of the left middle finger, and take up on the ball of the right middle finger the loop on the back of the left ring finger (Fig. 576 seen from above), and draw the loops out as far as possible to the right. 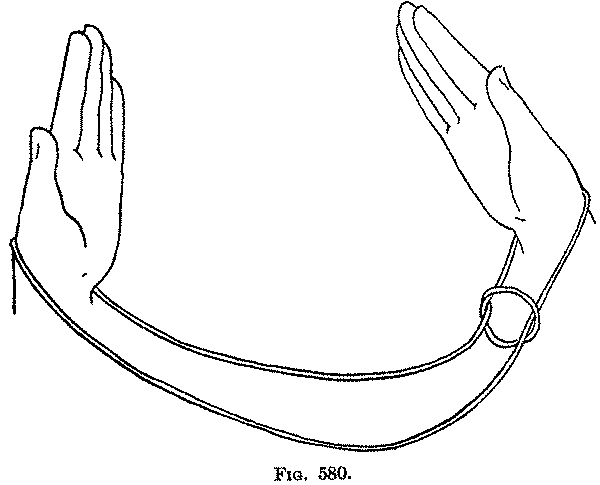 Turn the left hand with the palm upward, and "the chair" is formed, the back, by the loops held up by the right hand, the seat by the loop around the left thumb, and the four legs by the strings of the loops held by the left index and little finger (Fig. 577). "It was dark when he woke up, so he got a pair of shears to cut off a tallow dip." 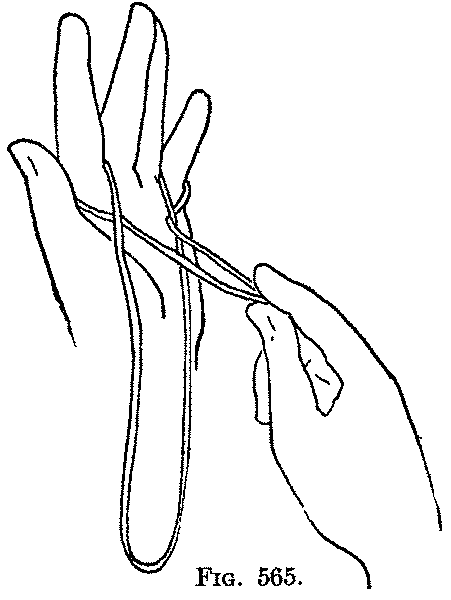 Ninth: Release the loop from the left thumb, and you have the "shears" (Fig. 578). "While he was cutting off the dip a constable came to arrest him, bringing along his tipstaff." 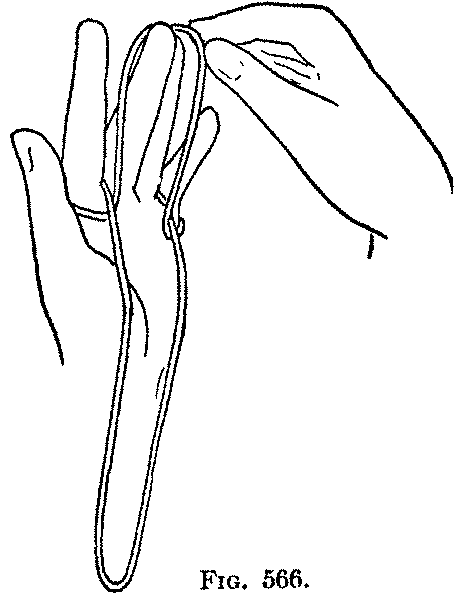 Tenth: Release the loop on the left index finger, and draw the hands gently apart to produce the long tipstaff, with the crown at the end formed by the small crossed loops on the right index and middle finger (Fig. 579). "The constable put handcuffs on the thief and marched him off to prison." Eleventh: Release the loop from the right index, and put the right hand through the right middle finger loop; put the left hand through the loop held by the left little finger. Separate the hands (Fig. 580) and draw the strings tight. This movement puts a loop on the left wrist and a slip noose on the right wrist. In principle, "Tallow Dips" is like the two preceding figures. It is one of the most important of all string figures, because of the story which goes with it. A careful study of its distribution in Great Britain, its varieties, and the different stories told while it is being played would, I am sure, be extremely interesting.